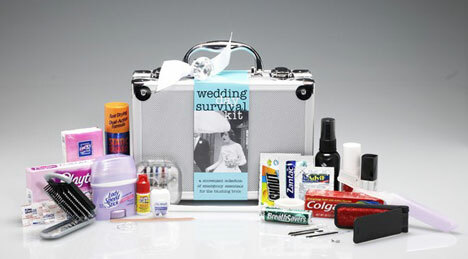 Remember Jennifer's great story on making a survival kit for your wedding day? And then we had the wedding hair kit too. Well, it seems you don't have to worry about it any more.. you can buy those kits all ready now. In a cool case too.. We just run into Frit Fru Weddings' e-store. (what did you think we do all day? surfing wedding websites! We 're hiring too :-) Anyway, Frit Fru pretty much has it all.. The case contains: Toothbrush, Toothpaste, Dental Floss, Mints, Drinking Straw, Pain Reliever, Antacid, Hand Lotion, Emery Board, Clear Nail Polish, Nail Polish Remover, Facial Tissues, Deodorant, Tampons, Adhesive Bandages, Hair Brush, Hair Spray, Bobby Pins, Interior Mirror, Lint Remover, Mending Kit, Scissors, Safety Pins, Stain Remover, Static Remover, Super Glue, Double-Sided Hem Tape, Earring Backs, Corsage Pins, and Extra Wedding Bands. Contents: Folding Hair Brush with Mirror, Hair Spray, Clear Elastics, Bobby Pins, Earring Backs, Emery Board, Clear Nail Polish, Mending Kit, Double-Sided Tape, Stain Remover, Static Remover, Breath Freshener, Deodorant Wipe, Tampon, Adhesive Bandages, Pain Reliever, Handkerchief, Dancing Socks. 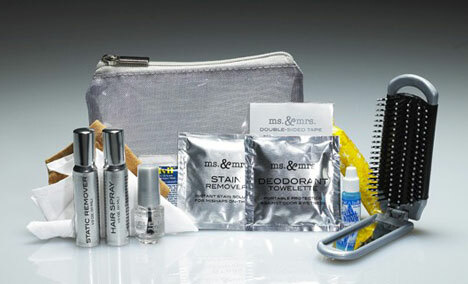 There is also a Groom's Survival Kit, a smaller Bridessentials Kit and afew more items. Check it out.